November 4, 2013 - Check out Voni Glaves' reporting on Dia De Los Muertos and earlier events like the 19th Annual Terlingua Music Bash, and an earlier invasion of the quail -- all with plenty of her always great photos. October 6, 2013 - In honor of Bob Wirt who has done so much for the families of Terlingua and the whole area we are making the Wirt family an honorary family of Terlingua. We have added the Wirt family to the Familias page and we have created a page for his parents and a page for Bob and Scarlett. We also created a Wirt Family Tree page. What makes these entries even more special is that Scarlett provided us with special photos which we included in these pages showing bob away from the Big Bend area. You can also see the photos in a slide show in Bob's own site Life Before the Ruins. May 28, 2013 - We have added Félix Luján Vásquez' obituary to the obituary page. His funeral Mass will be tomorrow. May 27, 2013 - Today is Memorial Day and we went to the Veterans Memorial Page in Familias de Terlingua and added a photo of Staff Sargent José Jiménez Martínez we received two years ago from his wife Anita Valenzuela Martínez . You can go see it by clicking here then click on the picture to enlarge it. While you're there you might look at some of the other Terlingua veterans on this day set aside to remember them. You might also play the great video memorial Hope Franco made for her father, David Franco. May 16, 2013 – Today we updated Lydia Mendoza’s page. Yesterday the United States Postal Service unveiled a stamp issued to honor her. Read about it and also read the rest of the page since we have made many changes and additions to the content and links of her page. 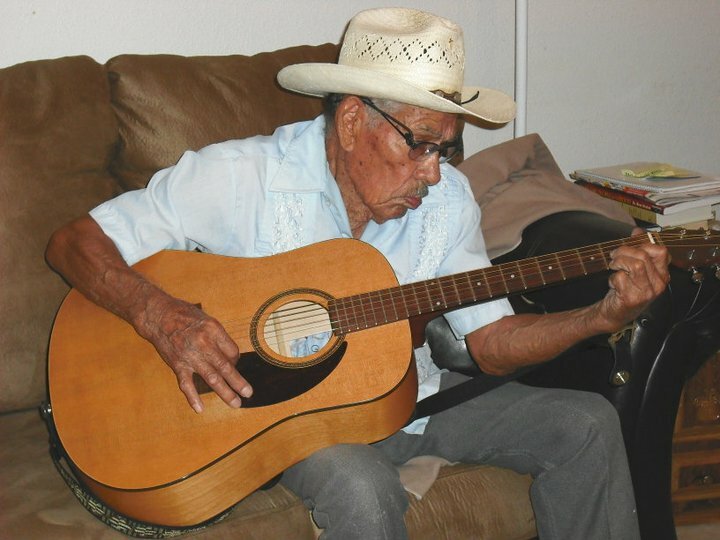 April 30, 2013 - Carmen Rey Jr. who was born in Terlingua in 1921 died at the age of 92 on April 19, 2013. We have added his obituary to the Obituary page. Click here to go see it. Facebook Castillo de Caliche https://www.facebook.com/darlapoet?notif_t=fbpage_fan_invite. February 17, 2013 - Antonio Esquivel donated the 1930 Model "A' that his father used to ferry his children to the Study Butte School. Antonio's two nephews, Juan Manuel Casas and Federico Villalba III bring us the news. Click here to read about the donation activites reported by Juan Manuel Casas and See the 60 wonderful photographs by Federico Villalba III. February 16, 2013 - Simona Briseño Payanes died at the age of 102 in her home in Carlsbad New Mexico. Her services were today. Click here to go to her entry in the obituary page. Click here to go to her parent's page. Click here to read her obituary. February 10, 2013 - We added four pages for the Cartledge family. We start with Samuel Vickers Cartledge, father of the Austin Lawyer, Eugene Cartledge who handled legal affairs for Howard Perry owner of the Chisos Mining Company. Eugenes' sons, Wayne and Robert lived in the Terlingua area and played many significant roles in the area history. Click each name to go to their pages: 1) Samuel; 2) Eugene; 3) Wayne; and 4) Bob. January 27, 2013 - Tia Nacha died. 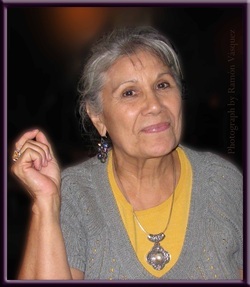 Ignacia Domínguez Galindo, 83 of Kermit died Friday, January 25, 2013 in Kermit, Texas. Rosary is tonight at 7:00 PM. Mass and burial will Monday in Kermit. Click here to see her service details in her obituary. Click here to see her family. January 13, 2013 - Bob Wirt passed away on January 12, 2013. He is a friend to all readers of this site. His diligent research of original documents and interviews with Big Bend family members was a major contribution to us all. Generous beyond expectations he gave us so much. We have added: (1.) a page for you to leave comments for his family; (2) an Obituary page with his Son Chris' moving remarks; and (3) photos and videos to his own website, Life Before the Ruins, that show him in his "natural setting." December 15, 2012 - We have added a photo of Santiago and Sofía Hinojos' children provided by Selma Huitron. Click here to see the Santiago Hinojos page. December 13, 2012 - Today we are greatly pleased to announce that we are adding an easy way to find anything anywhere in Familias de Terlingua. Use our new Search Function found on every page on the top right corner. This should greatly increase the usefulness of Familias de Terlingua for you. Try it now! November 29, 2012 - Rosary Tonight for Manuel C. Gambóa. Manuel C. Gambóa, 56, passed away on November 25, 2012. Rosary in his memory will be on Thursday, November 29, 2012, at 7pm at the Park Building in Rankin, Texas. Mass will be celebrated on Friday, November 30, 2012, at 10am at the Park Building in Rankin with Father Isadore officiating. Burial will follow in the Rankin Cemetery with arrangements under the direction of Shaffer-Nichols Funeral Home. Click here to go to his obituary entry. November 4, 2012 - Voni Glaves reports on Dia de los Muertos in our Terlingua Today page. When you click on the photo shown with her report you will go to a display showing great photos of the entire day. You don't want to miss them. We were so impressed with them, that we created a new banner for her page with one of them. When you sign on to view Familias de Terlingua you should make it a habit to check What's New and Terlingua Today for the latest news. November 02, 2012 - Celebrate Día de los Muertos with Darla McBryde's delicious gourmet offering "ofrenda" to celebrate not mourn the dead in a provocative way. And be sure to read the associated "about the Poem" to learn about the calaveras of Día de los Muertos and the artist who made them popular with the public. Read the Poem. Read about the poem. October 30, 2012 - Today we add two new pages to Familias de Terlingua. "Poetry" will feature poems with Terlingua area connection. Its sister page "About the Poetry" tells about the authors and their poems. 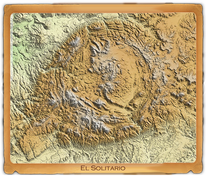 We start with Jalapeño Schwartz' "The Stones of Terlingua" and we also have Darla McBryde's "El Solitario" about the awe inspiring ancient caldera of a long forgotten volcanic eruption. Read the poems. Read about the authors. 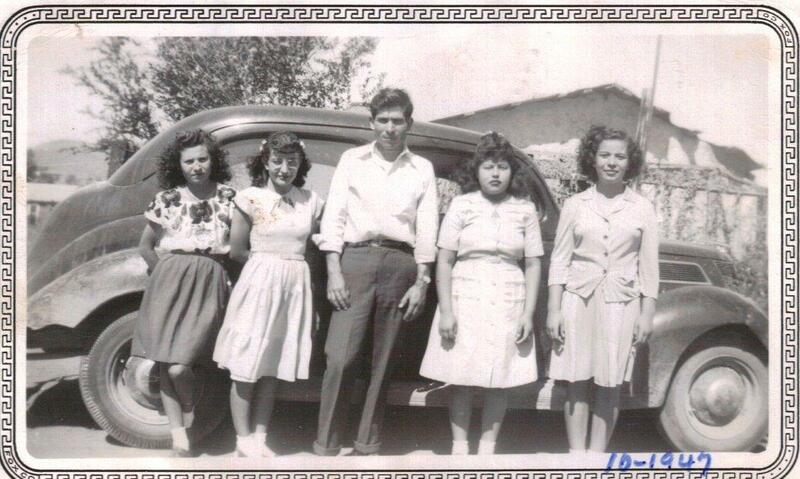 October 05, 2012 - Elizabeth Márquez has sent us four photos of her aunts and uncles that we have added to the family page of Fernando and Rosenda Baeza. Click on their names to see the four of Fernando Baeza's children who have new photos added: Luciana Martínez, Elidia "Lydia" Treviño, Matéo Baeza, and Telésforo Baeza. September 03, 2012 - Jesús María Vásquez' daughter Donicia "Nicha" Vásquez died last year. We add her obituary to the Obituaries page today. We also add photos of Donicia and her older sister Guadalupe "Lupe" Vásquez to their father's page, Jesús María Vásquez. The obituary and photos were supplied by Ramón Vásquez. place this weekend. We are adding a photo of Manuel Gambóa sent to us by his granddaughter Suzi Gonzalez. We are also adding a page for Jesús María Vásquez. The marriage of his daughter Virginia to Liberato Gambóa united the Vásquez family with the Gambóa family. In this page we also try to give more background. Our intention is to help today's readers understand the events of the family in the context of the times. August 27, 2012 - We have added a page called "Los Barandales del Puente" to the "Música de Terlingua" section under the tab "Terlingua." It has the transcription of the video we uploaded yesterday of Santiago singing "Los Barandales del Puente." Plus we added links to some other versions of this song including one with Antonio Badú and Luis Aguilar. August 26, 2012 - Norma Hinojos Carrillo brings us a video of her father, Santiago remembering serenading his future wife Sofía. First he tells us about it and then he shows us. You get to hear him play the guitar to accompany himself in his rendition of his courting song. Go to the Santiago Hinojos family page to see and hear this video. August 25, 2012 - The Gamboa 2012 reunion will be on Labor Day weekend in the Big Bend Park at Rio Grande Village Camp Ground. Johnny Rodriguez is coordinating the activities which include a silent auction, a fishing competition and lots of friendly competitions for a great time. Go to their reunion page where we expect to add photos. August 23, 2012 - Today we add four 2012 reunions to the Reunions page and add a page for the 2012 combined reunion of Familia Lugo and the Peña-Cano-Duran-Lugo family. We also add a Discussion page for their combined reunion. We will add more on the other reunions when we get it. 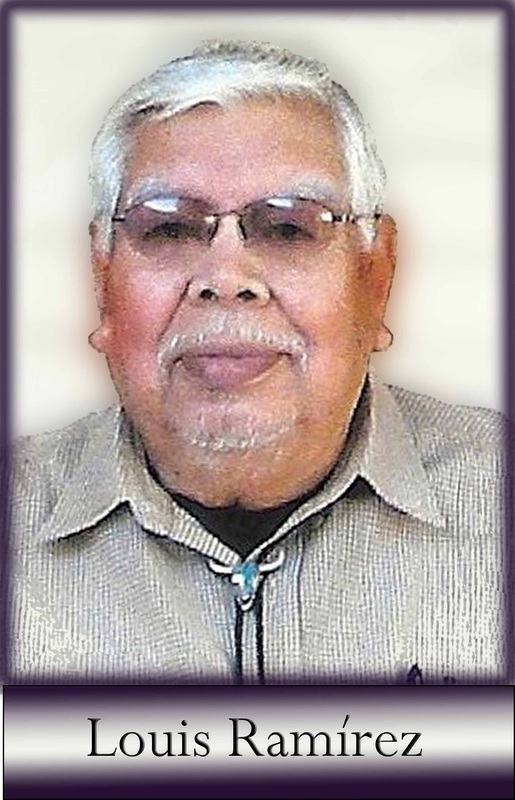 August 20, 2012 - Today we post Cruz Alacaraz' obituary in the Obituary Page. Louisa Franco Madrid submitted this to us. Based on that information we hope to add family pages soon. Click here to see Cruz' obituary. August 17, 2012 - Ramón Vásquez sent us a photo of his mom and aunts which we posted to the Julio Luján page and he sent us three photos of his family which we added to the Raúl Davalos Vásquez page. 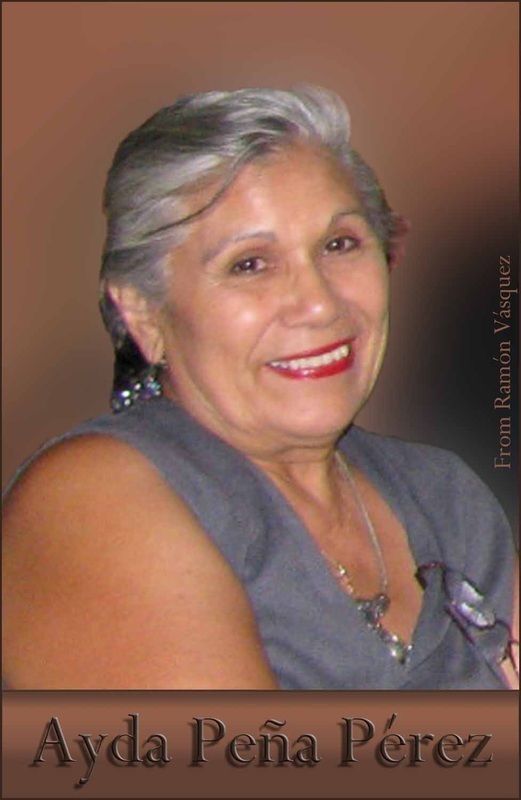 August 15, 2012 - Today we add two obituaries submitted to us by Louisa Herrera Madrid back in June. She sent us the obituary for Lola Huerta and also for Victoriano Huerta Lugo. Click here to go directly to their entries in the Obituaries page. Although they died in different years both lived to the age of 89. We do not have their families in this site so we would appreciate information to help us add pages on their families. August 15, 2012 - we have resolved the technical problems and we can now update Familias de Terlingua again. Thank you for your patience while we fixed the problem. 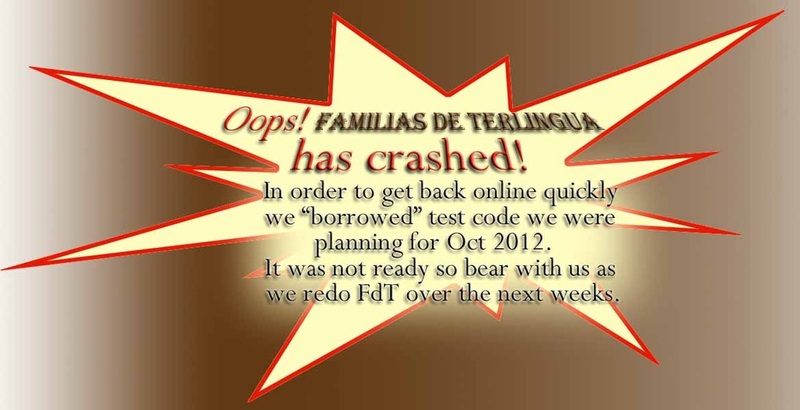 July 18, 2012 - the software that allows us to update Familias de Terlingua has not been working since June 21st. Service is now partially restored. We are sorry we have not been able to report on the reunions. We will try to catch you up shortly. June 21, 2012 - We added the Gamboa Family tree, and family pages for Bernardino, Anastacio, Dionicio, and Manuel Gamboa. These additions made it possible to link the Gamboa family with the Baeza and Ramírez families and through them to the descendants of Severiano Chavarría and Rita Ramírez. So now many of us can find many "new" cousins through this link. The Family Tree page should make it easier for you to find your "new" cousins. June 14, 2012 - Today we added a photo to the Juan Arispe family page. It shows the people who were in the wedding party for Tomasa Hernández and Juan Arispe. The photo was taken in 1947 and was provided to us by Louisa Franco Madrid. May 31, 2012 - We added the Román de la O family page with two pictures from their wedding. On September 10 1938 Jesusita Molinar married Román de la O. We have added a family page for them and their children. Louisa Franco Madrid provided us with two photographs from the wedding day. The bridesmaids include Rita Franco Sanchez who died a year ago on May 21. Oscar Hinojos is organizing a family reunion for all the family and descendants of Macario and Severiana Hinojos. We have setup an entry in the Reunions page for this reunion and we have created a discussion page so participants can communicate directly with each other. We will add any photos about and from the reunion. Selma Huitrón informs us that those family members who live in Mexico are already getting passports and making other arrangements to meet their US cousins. We will be updating the family pages for the Hinojos family in the following days adding more information. Last night at 7 PM there was a viewing and prayer service for Louis Ramírez, 80 at Nalley-Pickle & Welch Rosewood funeral home. The funeral will be today Thursday, May 24, 2012 at 10 AM at the Holy Trinity Catholic Parish in Big Spring, Texas. Interment will follow the funeral service and will be at Trinity Memorial Park. Louis married Isabel Chavarría in 1958. Isabel was a descendant of Severiano Chavarría. You may see Louis' obituary at the Nalley-Pickell and Welch Funeral Home and Crematory site We have added Louis to our Obituary Page. You can see a memento of Louis in our obituary page by clicking here. May 17, 2012 - Evelyn Fulcher's Obituary added to the Obituary Page. The Terlingua Moon newsletter reports in the current issue that the family of Evelyn Fulcher will have a memorial service the evening of June 3, 2012. Evelyn and her family kindly granted neighbors access to their ranches through the Fulcher ranch. Terlingua resident and artist, Bonnie Wunderlich has a great photo of Evelyn that you must see here. Presido to Terlingua Drive - Earlier this week we added a video that shows a speeded up camera view of driving from Presidio to Terlingua. Go experience the drive at http://www.familiasdeterlingua.com/terlingua-on-the-map.html#takeadrive. The 1940 US Census Record for the Pablo "Chiquito" Chavarría Family was added today to the Census Records Page and a link to the Census Record was added to Pablo's entry in the Severiano Chavarría page. Although Pablo was born in La Coyota, the census shows that the family was already living in Alpine by 1935. Pablo's wife María Chavarría provided the information to the census taker. It shows that they had three children: Celia who was 12 years old, Josefina who was 3 years old, and Francisco who was 1 year old. Celia was María's but not Pablo's daughter. Click here to go to Pablo "Chiquito" Chavarría. We also added more information to "The Story" and "Acknowledgements" sections of the Severiano Chavarría page. 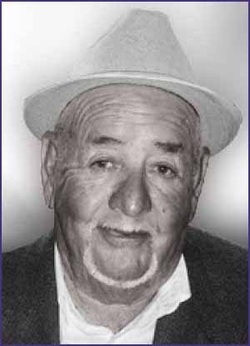 April 6, 2012 - Samuel González Molinar died March 28, 2012. We have added his obituary to the Obituary page. Click here to link to Samuel's obituary entry. The Alpine Avalanche reports Jose Flores Molinar, 84, died Monday, April 2, 2012, at Midland Memorial Hospital. His funeral services were conducted in Presidio Texas where he was interred Friday, April 6. Click here to link to Jose's obituary entry. January 13, 2012 - We are very excited to announce that starting today Voni Glaves will be in charge of the Terlingua Today page of Familias de Terlingua. Voni lives in the Terlingua area and shares what is going on with many of us through email and Facebook. Voni will report on the people, places, and events happening in the Terlingua area. This is not intended to be a newspaper or magazine; rather it should supplement existing sources of news. It is intended to make you aware of what is going on and link you to the existing resources for the details. It is aimed at people who live in the area as well as those of us who do not so we can keep in touch or plan a visit. Today she tells us about the gala opening tonight in Terlingua of True West, a play produced by Last Minute Low Budget Productions (LMLB). She has links to the Terlingua Moon for details as well as links to the website and Facebook page of Last Minute Low Budget Productions for the back story. Go to Terlingua Today. January 2, 2012 - We added the obituaries of Manuela "Nellie" Peña García and Ayda "Ida" Peña-Pérez to the Obituary Page. We had previously created an entry for Ayda there with links to her Condolences page, but had not yet added her obituary. We have also added a family page for Ayda and her sons. We have moved her photographs from her parents' page to her own family page. Friday December 30 at St. Joseph's Catholic Church in Fort Stockton, Texas. To see her obituary click here. December 23, 2011 - We have added this photo of Eddie Pfiester, Howard Tyson, and Ayda which Betsy Tyson submitted. Betsy and several of you have informed us that the link to submit your condolences was not functioning. We hope we have corrected that. Click here to go to Ayda's Condolences page. At the bottom part of the page is where the comments show up as well as the form to enter your condolences and remembrances as you wish. It is titled "Leave a Reply." Don't let that confuse you. This is an important holiday for many fans of Familias de Terlingua. Though Ayda's passing saddens us, it makes us appreciate the loved ones we have around us. With that thought, enjoy your holiday with your loved ones. 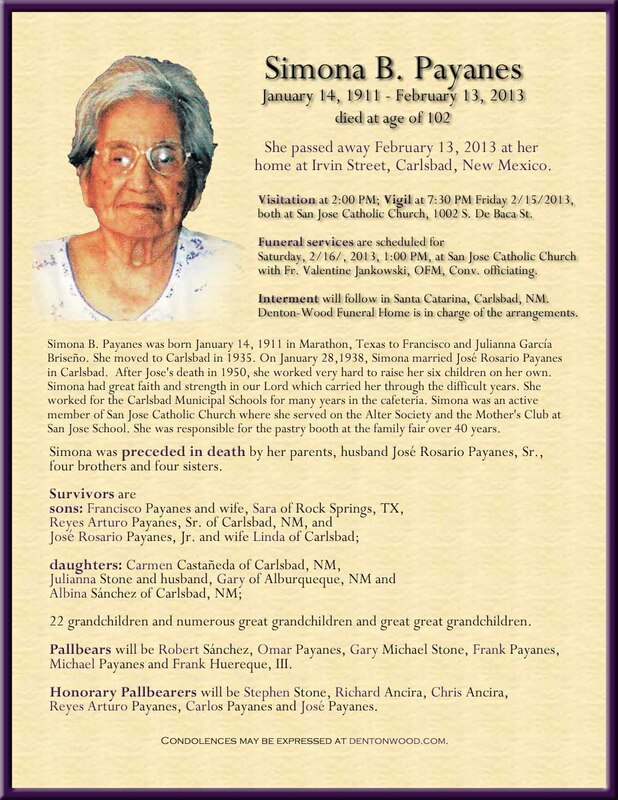 December 23, 2011 - From Ayda's sister Josefina "Josie" Peña Granado we are informed that Ayda's funeral is set for Friday December 30 at St. Joseph's Catholic Church in Fort Stockton, Texas. Interment Services following the funeral Mass at St. Joseph's Cemetery. There will be a memorial service in California but details on that are not yet available. December 22, 2011 - Today we added several new photos of Ayda sent to us by Juan-Paz Peña. We also added a link to the FSHS Class of '61 50th Class Reunion photos from Carey Page. Click here to see the new photos. December 21, 2011 - We have added Ayda's entry into the Obituary Page. It has a link to her Memorial page where you can leave condolences for the family and leave your remembrances of Ayda. A Patterson woman described as a community activist in local politics died in a two-vehicle crash just south of town Sunday afternoon, Dec. 18. Ida Peña-Pérez, 67, was killed on Highway 33 after a black Chevrolet Suburban driven by 19-year-old Kendall Ann Schene of Modesto drove through a stop sign at Marshall Road and hit her blue Toyota Highlander, according to the California Highway Patrol. "Its a shock having this accident involving Ida," Patterson Mayor Luis Molina said Monday. "I'm still in shock at what was lost - a community member that was so involved and cared. She had a big heart." Perez's passenger, Sylvia Guadalupe Moreno of Patterson, was transported to Doctors Medical Center in Modesto with moderate injuries following the accident shortly after 1 p.m., said Officer C. Allen of the CHP. She has since been released, according to hospital staff. Schene was treated for moderate injuries by emergency responders at the scene and then planned to receive medical attention from her doctor, Allen said. _Schene was driving westbound on Marshall Road to go to a Patterson-area function, and Perez and Moreno were heading southbound toward Newman to check out the Christmas Mass schedule at St. Joachim's Catholic Church at the time of the accident, Allen said. It was not immediately clear whether Schene drove right through the stop sign or whether she tried to apply the brakes, Allen said. However, he said any kind of last-second braking would have been hindered by the railroad tracks on the east side of the intersection. "(Schene) wasn't from the area and wasn't familiar with the area," Allen said. The CHP has ruled out drugs and alcohol as a contributing cause. In addition, fog did not play a role in the crash, as visibility was about two miles in the Patterson area at the time, Allen said. An investigation is ongoing, he said. "No charges are pending at this point, but I can't comment on what might happen," he said. Perez was well known for her political activism, regularly attending City Council meetings and frequently commenting on the Patterson Irritator blog, which is critical of certain council members. Is she in the Macario Family photo at PCDL Photos 2? Let us know if we missed a page in Familias de Terlingua with Ayda's comments or photo. Click here to send info. December 11, 2011 - Familias de Terlingua crashed late Saturday night. The backup code was accidentally erased. The only way to bring it back online was to use code we were slowly developing for October 2012. So we "borrowed" the code. But since it wasn't finished, we worked over the weekend to try to get it as functional as possible. It is not complete, but the new format and structure should allow us to do things we couldnt do before in the prior format. December 6, 2011 - We have added a link from Santiago Hinojos' page to his entry in the National Purple Heart Hall of Fame. If you want to enroll someone in the National Purple Heart Hall of Fame you can access the enrollment form at this link. On October 22, 2011 Ayda Peña and then on November 23, 2011 Joe Baeza contributed to the discussion on calling Fort Stockton "Comanche." Read the discussion and if you want to add your thoughts at the Comanche Discussion. November 25, 2011 - Today we updated the Santiago Hinojos and Sofía Hernández family page. We added links from Sofía to her parents' page Guadalupe Hernández that we added yesterday. We also added several photographs to the Santiago-Sofía page. We also added photographs to the Facebook Familias de Terlingua fan page. By the way, a descendent of Terlingua, Joe Madrid, who is a reporter for an Arizona newspaper has his own website, Fabulous Fables, which may be great for family reading over the holidays. Check it out at http://fabulousfables.com/Default.aspx?pageId=1117633 Green Eggs and Ham and a Tortilla too. November 24, 2011 - Happy Thanksgiving to all. Today we add the family of Teresa Baeza and Guadalupe Hernández. Norma Carrillo supplied photographs. Guadalupe's father Cipriano and his brother-in-law, Leandro Silvas are credited as being the first settlers of what later was called Castolón. The genealogy research is from family members and Bob Wirt. We also started a page for Castolón. It can be reached from the navigation tab "Terlingua on The Map" or click here to see it. _November 11, 2011 - Veterans Day Under the Memorials navigation tab at the left we have a Veterans Memorial page tab to honor the veterans from Terlingua or veteran descendents of Terlingüeños. We also want to honor those we have not yet had time to add to the page. 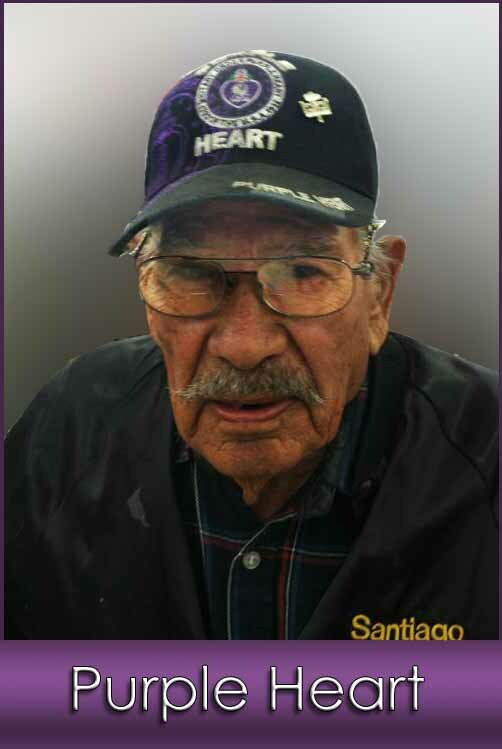 Today we add Santiago Hinojos, aged 93, to the Veterans Memorial page. As a medic he was unarmed and yet was in some of the bloodiest battles doing his duty -- helping the wounded. Being injured himself did not stop him. He went from Normandy, through the Battle of the Bulge on into Berlin. We have links to an interview the Odessa American conducted with Santiago. View Santiago's entry in the Veterans Memorial page. 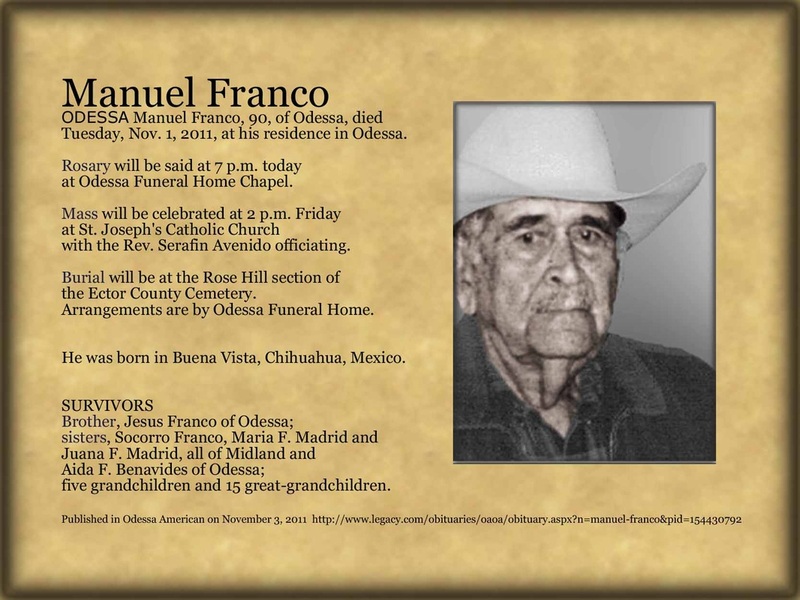 We have added Bonifacio Franco, Sr. to the Obituary Page. His obituary was published in The Odessa American on November 4 and in The Fort Stockton Pioneer on November 10. Click here to go to the Obituaries Page. Or click here to go to Bonifacio's Obituary Page. Legacy.com has an Army Memorial Site where they honor veterans and link their obituaries. Bonifacio was a veteran who served in the Korean War. Click here to see Bonifacio's entry in the Army Memorial Site. November 10, 2011 - We have added a page for Lajitas in the Terlingua on the Map page which is under the Terlingua tab in the navigation bar on the left of all pages. The page has a map showing Lajitas in relation to Terlingua and Study Butte. We also have the latest Lajitas news from Austin American Statesman August the 5, 2002. Click here to view it all. November 3, 2011 - Rosary for Manuel F. Franco will be today at 7 PM at Odessa Funeral Home Chapel. Mass will be celebrated at 2 p.m. Friday. Click here to read his obituary. _We also added photos of Manuel's parents Jesus and Ventura Franco as well as a photo of his sister Socorro who survives him. Click here to see photos. November 1, 2011 - Two Franco family members died today. Manuel F. Franco of Odessa was found dead in his bed this morning. He was a first cousin of Bonifacio Franco of Fort Stockton who died the same day. Bonifacio never fully recovered from injuries sustained from the fire that killed his brother, Julian, earlier this year. The Franco family has been hard hit this year with the passing of Tino Franco, Julian Franco, Rita Franco Sanchez, and now Manuel and Bonifacio. We will post their obituaries and other details as they become availble. Go to Manuel. Go toBonifacio. October 31, 2011 - The Mysterious Lights of La Cueva de Las Brujas [the cave of the witches] by Louisa Franco Madrid is presented for our Halloween enjoyment as the fourth in the series of remembrances of stories from Terlingua appropriate for Halloween. October 30, 2011 - We continue the Halloween theme with another recuerdo of lechuzas from Antonio Franco about a conversation he had with Crucita, a well known curandera from Ojinaga MX, who surprised Antonio with her answers to his questions about lechuzas. October 28, 2011 - Maria Isabel Pando, daughter of Leonardo Pando, has written a nice remembrance of her father. Leonardo was quite the cowboy. He worked on many ranches. He taught his horse tricks and was well-known for breaking horses. The corrido of the 101 Ranch tells of his exploits breaking and riding horses. October 27, 2011 - The Luis Baeza and Pomposa Domínguez family page has been updated. There is now a photograph of Pomposa with two of her daughters, Cristina and Josefa. When Josefa was small the family moved to Fort Leaton. There is a short writeup about Fort Leaton with a link to the history of Fort Leaton on the site Texas Beyond History and a video from the Texas Parks and Wildlife showing Fort Leaton. October 18, 2011 - Help us identify people in the photographs. We added two photographs to the Julio Márquez Luján page. Ramon Lujan asks for you help in identifying some of the people who appear in the photos. Click here to see the photos. October 16, 2011 - Added a photo of Luciana Ramirez Baeza. Manuel Sánchez Baeza* collaborated with Bob Wirt to add more family members to The Marcelo Baeza Family History Version 9, revised October 14, 2011 the Documented Research Report in Bob's website Life Before the Ruins. Don Manuel's cousin, Elizabeth Marquez, provided a photograph of Luciana Ramirez Baeza her great-grandmother. We already had Luciana in her own family page; today we add her photograph. We thank Elizabeth Marquez and Bob Wirt for allowing us to add it to Familias de Terlingua. Click here to see Luciana's page. * His name is shown in Mexico name order which he himself uses; his name in U.S. name order would be Manuel Baeza Sánchez. Ayda Peña Pérez contributed to the Comanche Discussion. Chacho Gonzales' comment (see Chavarría Family Discussion) resulted in us adding the Senón Chavarría family page. Chacho had commented on the Comanche Discussion page the week before and this week he provided us with family information. We took the liberty of copying the comment he made to the Chavarría Family Discussion but left the original entry in place too. We also added the Valente Gonzales family page. 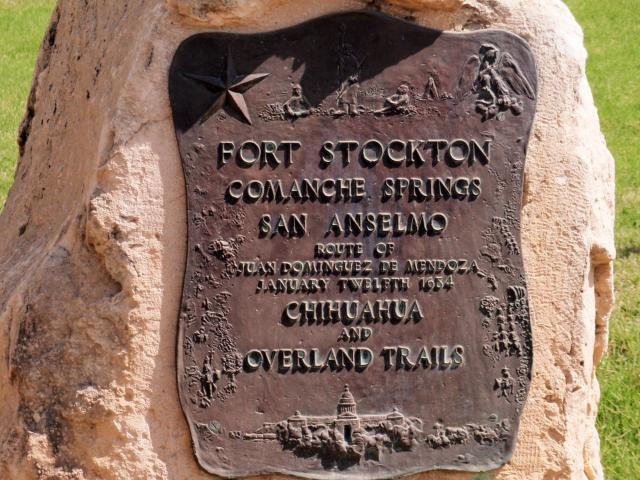 October 4, 2011 - Chacho Gonzales adds to the discussion on the use of the name "Comanche" for the Fort Stockton area. We also added nine pictures to the discussion page. If there is a lot of interest we may create a page for Comanche. Check it out here. October 2, 2011 - New font selected for our title by our readers. The voting was close among the first three choices. Here you can see our new Logo with the new font to start our third year. We thank all of you who voted. September 29, 2011 - The Southard/White Family Reunion is coming up September 30, 2011 to October 3. A comment has been posted already in the reunion discussion page. Last Spring Bill Waters announced the reunion on our site and we added a discussion page for reunion participants to communicate with each other if they want. Mary Ann White Rodriguez has posted the first entry. All are welcome to use the discussion page to communicate with each other. It is your page. Use it as you want. We look forward to posting photos and accounts of the reunion. September 30, 2011 - 2nd. Anniversary! website, and you keep it alive. So congratulations to our readers and contributors. This site is about the families. 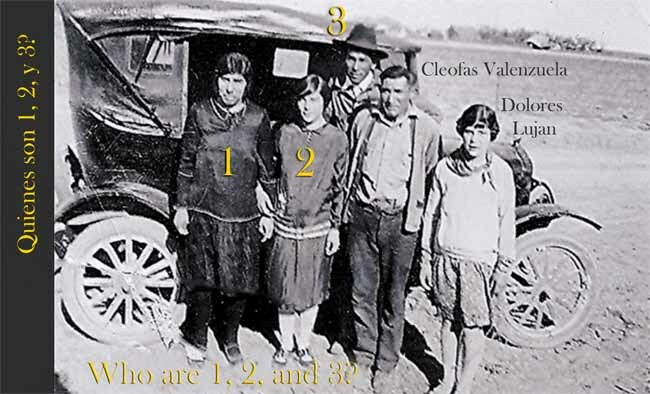 The families that at one time lived in the Greater Terlingua Area. But the families continue and so this site is about you too. On September 29, 2009 we put up a temporary site with family information. By supper time the next day interest had exploded so fast that we moved to this permanent site! Thanks to a comment form submitted to us by Simon Hernández, Jr. we added a family page for Antonio Hernández, grandfather of Simon Hernández, Jr. We also added a family page for one of Simon Junior's aunt, Tomasa, who married Juan Arispe. The name Antonio Hernández was added to the Familias page. Juan Arispe was linked to the Arispe Family Tree. Voting will end at 3:00 AM Saturday October 1, 2011. As of today the top two fonts shown at left are tied for first place. The third one is only one vote behind. Please vote for your choice of font for this site's title. If it ends in a tie, the editor of the site will cast the deciding vote. Go to Announcements page.